The new 66.5 meter offshore blades on Hitachi's 5.2MW wind turbine. Photo courtesy: Hitachi Ltd.
LM Wind Power has successfully completed installation and testing of a 66.5 meter wind turbine blade, ordered by Hitachi, Ltd. for offshore application. LM Wind Power and Hitachi commenced installation of the 66.5 meter blade in 2016 with the aim of optimizing Hitachi's 5.2MW platform to operate effectively also in lower wind sites. The new LM Wind Power blades will now enable Hitachi to offer their 5.2MW wind turbine with a rotor size of 136 meters. 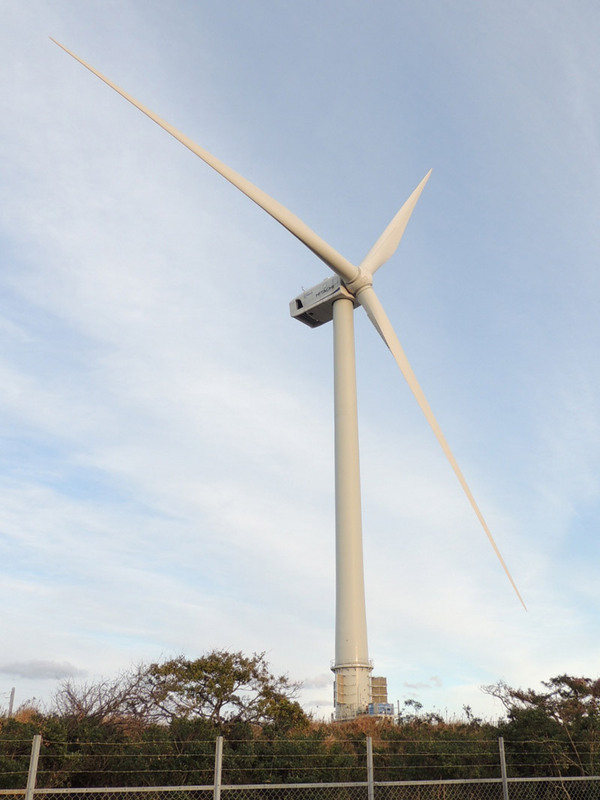 The 66.5 meter blades have been tested on a wind turbine of the Kashima Port Fukashiba Wind Power Station in east Japan since October last year. LM Wind Power CEO, Marc de Jong said: "We are very pleased to support Hitachi, a leader in the development of wind power in Japan, in this offshore development of a new rotor for their 5.2MW platform. We look forward to seeing the 66.5 meter blades generate clean, renewable energy in lower wind sites along the coast of Japan's main island." The 66.5 meter blades were produced in LM Wind Power's blade manufacturing facility in Jiangyin, China.